You've just met my friend Molly, Queen of Gadgetry. After reading about what a tech savvy woman she is, I should be embarrassed to tell this. I have a new iPad. Except, I haven't even taken it out of the box yet 'cause I am totally intimidated by it. If you're a Facebook friend, you already know this. But lots of folks have popped in at Facebook to tell me I don't need to be scared of it, and my friend Jill (who conveniently lives right up the road, AND is the proud owner of an iMac along with being a self-confessed computer nerd) has offered to help me with it. And Molly has talked me through some of my tentativeness, so I'm slowly getting there. As I get busy and start playing working with this little toy important piece of equipment, I'll keep you posted on how it goes setting it up, how I like it, what I don't like, etc. And while we're doing this, any of you who can hop in with hints and tips will be MUCH appreciated. 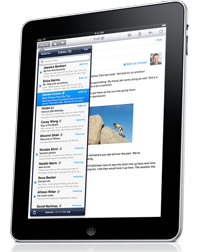 Any iPad stories you care to share? Good or bad - let's hear 'em! Do you have particular apps you can recommend? Some I should avoid? I am the total opposite of Molly. I'm really not much of a gadget person. My Palm Pilot has been my closest relationship ever with a gadget. And now, bless its heart, I'm on the verge of leaving it behind (I think) as we transfer all the information I have accumulated on it over the years to the new iPad. I feel a little bad, and even a bit fickle about all this actually. I've called my Palm Pilot my "electronic brain," and I've relied on it to be my "back-up brain" for a long time, and it's been very loyal and steadfast. I have loved it. And I'm VERY nervous about transferring my life off it onto the iPad. Wish me luck! and check back to see how it's coming along! Part 2 Coming Soon ! Definitely keep us posted, Kaye! Thanks. You are a braver soul than I am. Technology and I don't work well together. The computer barely lets me type. LOL Best of luck. Kaye, you are going to love it! I just know it will be your new best gadget. Ooh, I'm feeling stirrings of envy . . . I'll be interested to know how this goes for you. Now, I just find this very interesting. All five of us are bloggers, and our technical expertise runs the entire gamut. No correlation between blogging and technical savvy, I guess! I have played with my newest little buddy today, just getting started, so not enough yet to really form any opinions, but soon. Check back! Vicki - I'm still coveting your wonderful Nikon!!! One of these days . . . I love gadgets and toys and new software -- they're wonderful tools for expert procrastinators (like me).